Since we’ve already ponied up about $140 billion keeping Frannie afloat, the news that FHA most probably is going to need at least $13 billion to maintain a minimum amount of solvency probably makes you shrug and note it’s just chump change. Keep in mind that once upon a time, a central banker assured all of us that a measly $50 billion hiccup in the subprime mortgage market was nothing to worry about and posed no danger. 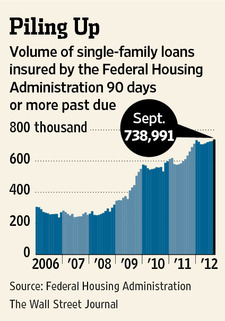 The WSJ today reported that FHA is pretty much bankrupt or whatever the government equivalent of that situation might be. The Federal Housing Administration will exhaust its capital reserves and faced a deficit of $13.5 billion at the end of September, according to the agency’s independent annual audit set for release on Friday. The report shows that the agency’s reserves aren’t adequate to pay for expected losses on the $1.1 trillion in loans that it guarantees, which means the agency is likely to require taxpayer funding for the first time in its 78-year history. The FHA’s annual audit estimates how much money the agency would need to pay off all claims on projected losses, against how much it has in reserves. Last year, that buffer stood at $1.2 billion, representing around 0.12% of its loan guarantees. Federal law requires the agency to stay above a 2% level, which it breached three years ago. I think it’s pretty much fair to say that the agency is pretty much unreserved, don’t you. Lest you think that FHA is just a Johnny Come Lately to the party and somehow managed to nurse along a lot of loans made during the bubble years, reconsider. 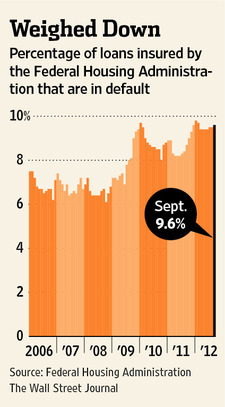 It seems that the bulk of its delinquent loans were made in 2007 and 2008. If memory serves the world pretty much had figured out then that making essentially no down payment mortgages carried a bit more risk than conventional wisdom had dictated. Perhaps they were buying the snake oil that central banker was selling at the time. In each of the last three years, Obama administration officials have shot down the idea that the agency would draw on the Treasury, except under the most dire home-price forecasts. As recently as this past February, when the White House’s budget forecasts showed that the FHA was in the red by nearly $700 million, officials said pending legal settlements with large banks would plug that hole. Administration officials could announce measures that would either avert the need to draw on the Treasury or cushion the blow of such a move, such as raising mortgage-insurance premiums and finalizing additional legal settlements with lenders, industry analysts expect. Assuming that the money can’t be squeezed from the private sector, despair not. The FHA apparently has what is called “permanent and indefinite” budget authority. In English that means that no one, not Congress, no one has to act on their need for cash. The Treasury is obligated to advance them whatever amounts of money they need. Why can’t we do this with everything and avoid all these fiscal cliff dramas? Well, as I said at the start of this post, there isn’t probably anything to get worked up about here given a $13 billion rounding number. Just a one time shot of money from somewhere will put all of this behind us. Won’t it?